After a huge year with releases on legendary Strictly Rhythm and Moodymann’s Mahogani Music, the Tel Aviv producer blesses Sol Power Sound with a four-song EP of thick Afro-disco, bumping house, and twisted techy grooves. The EP opens with Let’s Go, a peak-time banger with chugging drums, rolling bass, spooky synths, and a few dusty samples. Hotel Room started in, you guessed it, a hotel room in Accra, Ghana with a suitcase full of newly acquired Ghanaian percussion instruments. 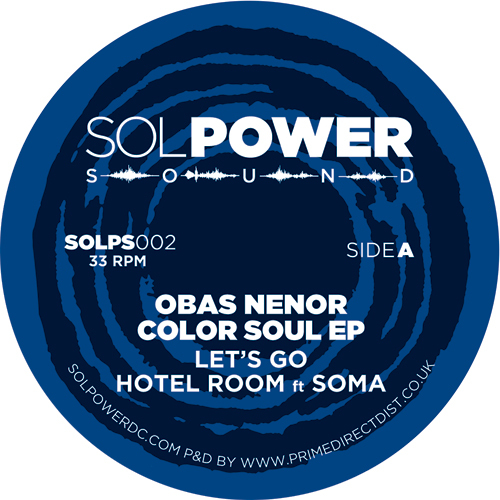 Obas Nenor finished it off with catchy vocal chops, synth melodies, guitar, and chatted vocals by Soma. It’s an infectious mid-tempo groove and a Sol Power favorite. NoNooZa is a deceptively rugged Afro-disco / house hybrid full of heavy Sonics and texture. After a gradual build, NoNooZa morphs into a tough-as-nails dance floor bomb. Obas Nenor fittingly describes Tribe Tribute as Afro-tech. The EP closer is packed with deeeeeeep late night vibes that will move a heady room well into the morning.